Andian Sales has refined the existing range of removable above ground bollards. 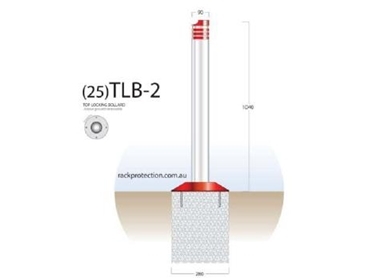 The TLB -2 features a top locking function. Each of these removable bollards is supplied with two keys which on ordering are able to be keyed alike for multiple bollard orders. The locking mechanism has been improved to enable the operation easier than in the past. To unlock and remove the bollard, simply insert the key, turn, twist the bollard and remove. Removable above ground bollards are best utilised where delineation is required while maintaining the ability to access the areas by authorised personnel, their trolleys and/or their vehicles. The removable above ground bollards simplify installation over their in ground counterpart bollards. To install onto concrete surfaces just ensure the removable above ground bollards are level, drill the four holes in the concrete to correspond with the holes in the bollard’s flange and using 12mm diameter x 75-100mm long dynabolts and install the bollard. Round in shape, the removable above ground bollard is made from mild steel and weighs 12 kg. Product dimensions: height – 1040mm; diameter – 90mm; base plate – 280mm cast.